The galaxy cluster named SDSS J1138+2754 acts as a natural gravitational lens, distorting the view of other cosmic object that lie behind it. 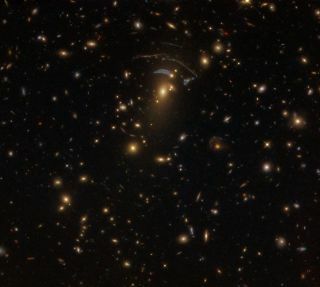 NASA's Hubble Space Telescope photographed a stunning galaxy cluster whose gravity acts as a natural lens, bending and blurring the view of galaxies that lie behind it. The galaxy cluster, also known as SDSS J1138+2754, was photographed using Hubble's Wide Field Camera 3. When a massive object, such as a galaxy cluster or a black hole, falls between an observer (like the Hubble telescope) and a more distant target in the background, it creates a so-called gravitational lens that magnifies the observer’s view. "Gravity is so much a part of our daily lives that it is all too easy to forget its awesome power — but on a galactic scale, its power becomes both strikingly clear and visually stunning," the statement said. What's more, when the light from the distant objects reaches the observer after passing through a gravitational lens, it may appear magnified, as if it had passed through a giant telescope, or reflected. "Since galaxies are wide objects, light from one side of the galaxy passes through the gravitational lens differently than light from the other side," according to the statement. "When the galaxies' light reaches Earth, it can appear reflected, as seen with the galaxy on the lower left part of the lens, or distorted, as seen with the galaxy to the upper right." Therefore, some of the more-distant galaxies captured in the new Hubble image appear multiple times, because the gravitational lens distorts the light from the object similar to how fun-house mirrors distort a person's reflection. The new Hubble image was taken as part of a research project on star formation in the distant universe. In addition to SDSS J1138+2754, Hubble identified 73 other galaxies that also act as gravity lenses, according to the statement.